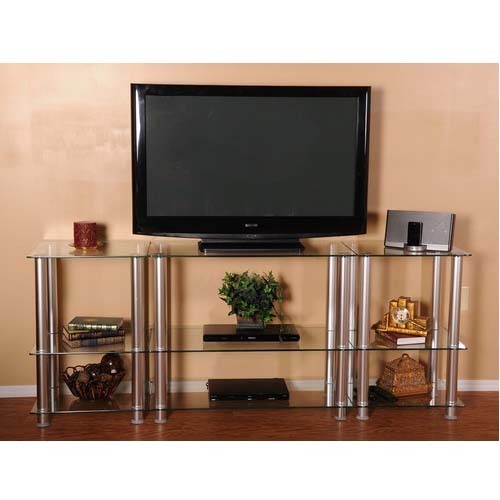 More on the RTA Extra Tall Clear Glass and Aluminum LCD and Plasma TV Stand TVM-0075 below. Two 8mm-thick clear tempered glass shelves. Ample storage space for your DVD, VCR, gaming and/or stereo components. 3 piece design (middle stand and 2 smaller side stands) -- configure them however you'd like! One 35 inch wide (TVM-002) TV stand and two 20 inch wide side pieces (TVM-005). Also available with frosted glass shelves and white frame. See related products below. Plasma and LCD TVs up to 75 in.